Pin and Gly are from Singapore. 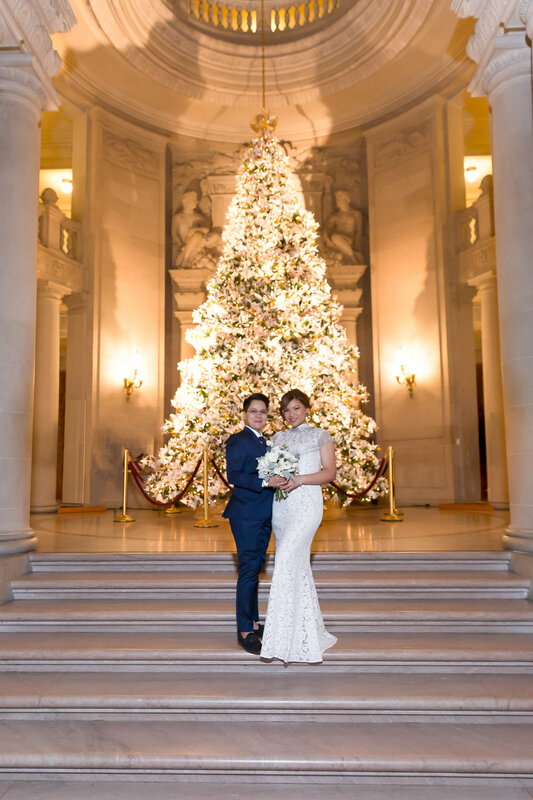 Pin hired me through Thumbtack back in October as they planned to get married at the San Francisco City Hall in late December. 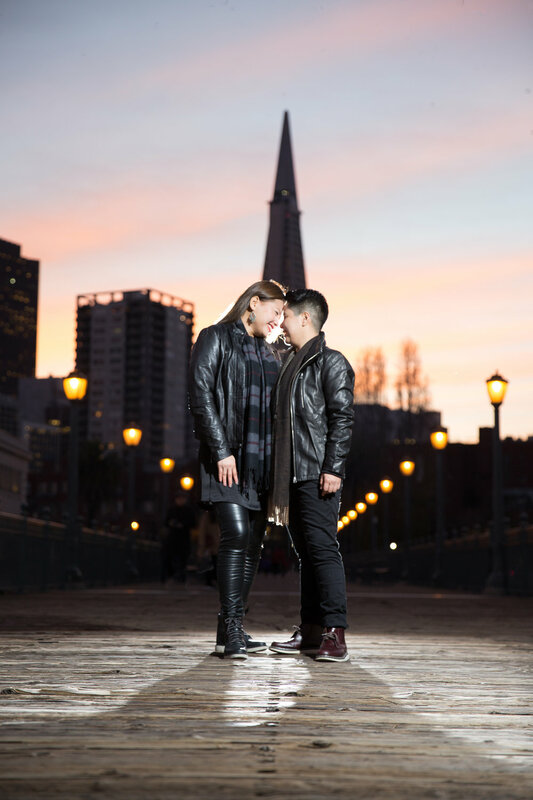 The effervescent couple wanted to take in San Francisco as much as they can during their stay and I offered to shoot pre-wedding portraits at the Embarcadero waterfront few days prior to the City Hall wedding. 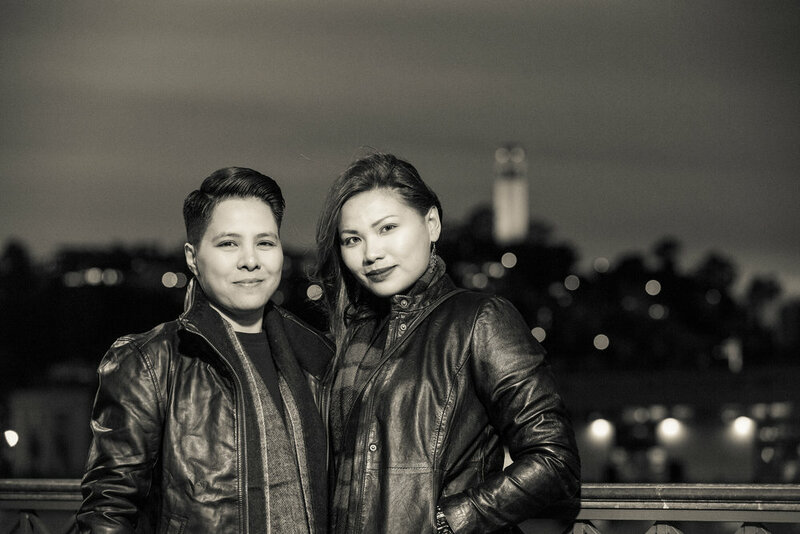 We met at the Pier 7 where you can set up to take shots with the pier lined lamp posts converge to the Transamerica Building, the Coit Tower, and the Bay Bridge as the background. We then headed off towards the Cupid's Span, but the sun had set by then and we opted to do a shot with the Ferry Building and the streaming traffic frozen in time with a rear-curtain sync. 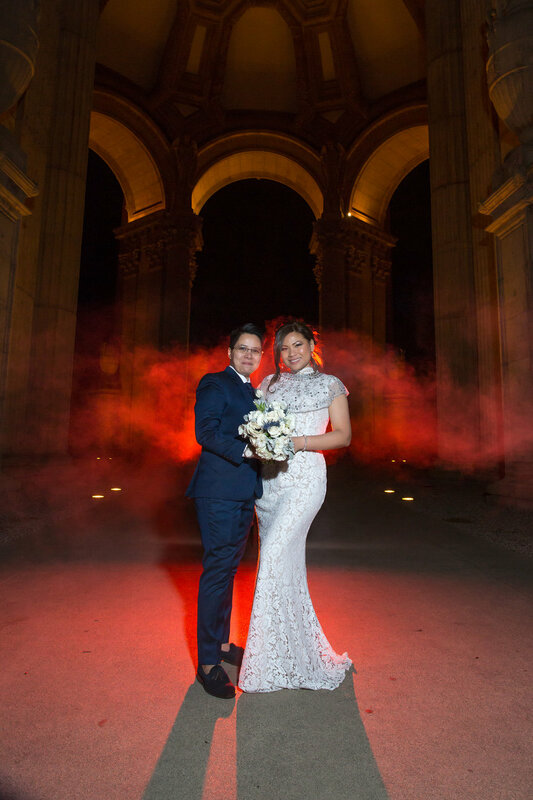 While this was a civil service affair, we accompanied Pin and Gly for the entirety of the wedding day beginning with the wedding preparations at the Hilton Union Square. BTW, the make-up artist, Meghan Elisabeth, is fabulous with the airbrush. If you are looking for that specialty, look her up. We really enjoyed the shoots at the City Hall. 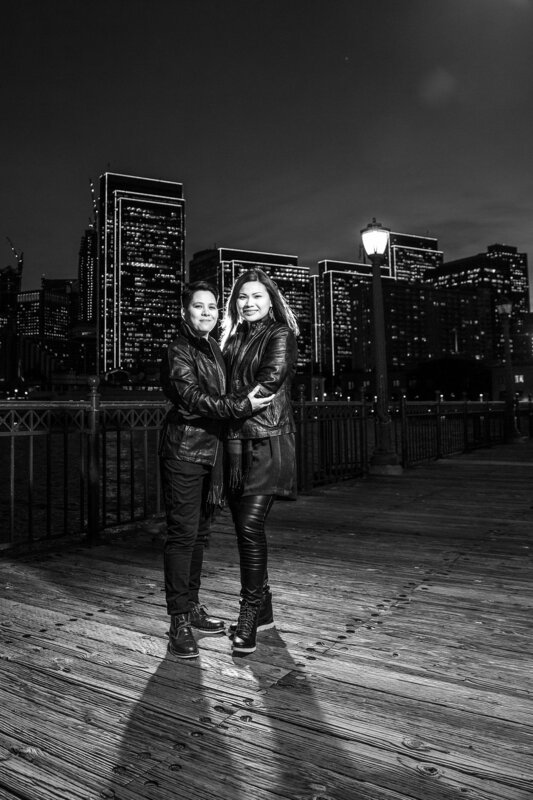 I went a little overboard with backlighting the couple, but we were all happy with the results. We all enjoyed the exit shot at the City Hall. Since we stayed until closing to get the best shots without the crowd, by the time we went for the exit shot, it was all dark. On a whim, I placed one of my speed lights on the steps just behind the door and had Pin and Gly exit out in style. The shot you see is a result from about half-a-dozen tries. We then drove over to the Palace-of-Fine-Arts in the dark to shoot some moody shots with multiple speed lights with gels. The celebration was capped at one of the restaurants in Pin and Gly's "must-go" list that was the 'Mel's Diner' just a few minutes away from our location where I introduced the newlyweds to Mel's signature 'wet fries'. We had so much fun, we look forward to Pin and Gly visiting us back again.